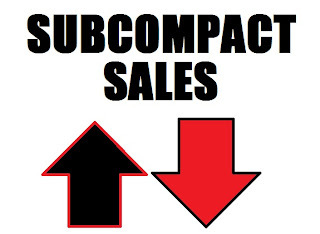 Not too bad of a month for subcompacts in March; it certainly looks better than last month. The big winner in March, and certainly going out like a lion, is the Mazda2, which has a gigantic 138.1% increase over this time last year. That big sales boost also brought it's year-to-date sales back into the green. In fact, March accounts for nearly 72% of all Mazda2 models sold in 2014. The Nissan Juke also had a good month, up 77.3% from this time last year, and more importantly, up 71.1% overall this year. The hot-selling Buick Encore also is up in the 75% range this month and also has a whopping 116% overall sales increase compare to 2013. Who says Americans don't want a baby Buick? The bottom three slow-sellers all belong to MINI. This may be because there is a new MINI Cooper hitting showrooms soon, and stock might be low. Regardless, the MINI Hardtop and slow-selling Coupe and Roadster all were down more than 50% compared to March '13. Nissan's Versa, although down for the month and year, is still outselling the Kia Soul, although not by much. The MINI Coupe continues to be the lowest-volume subcompact on the list having moved only 262 units this year. A few other bits of interest: The Mitsubishi Mirage continues to sell pretty well, and outsold a lot of other vehicles on the list including the Fiat 500L. Another A-segment car, the Chevrolet Spark, with it's winning combo of price, size, and equipment, continues to sell well. Finally, the Toyota Prius c is outselling the Yaris by more than 2:1. As a side note, you can now look at the last three months of subcompact sales by clicking on the tabs at the bottom of the chart. Happy browsing! - A shame Nissan doesn't break out Versa Note and sedan sales. - For that matter, fleet vs. retail sales for the whole segment. - Next big wild card is the Mexico-built thirdgen Honda Fit. The Fit's been supply-limited its' whole time on the US market, so I wonder what the demand ceiling is.